Saizen, the authorized Philippine retailer of Daiso-Sangyo Inc. Japan which is Japan’s number one ranking livingware supplier, means “best choice” in Japan is catching the eye of shoppers in the country as they offer all items at 85 pesos (PHP). This concept store offers a variety of products, many of which are available only in Japan. With Daiso-Sangyo, Inc. having over 2,500 stores all over Japan, fabulous and unique finds are guaranteed for shoppers with various lifestyles and interests. This afternoon, I had the opportunity of shopping at Saizen located at the 3rd level of the Robinson’s Galleria with other bloggers. 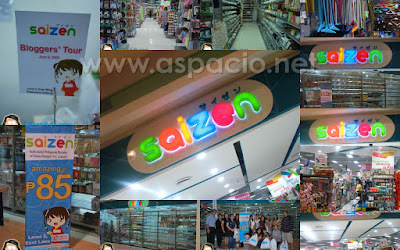 This is the first Saizen store in the country which opened on April 29, 2009. Armed with P850 worth of play money, I braved the aisles of the concept store and selected my 10 great finds and below are the items I selected. The criteria I used as I selected the 10 items were the item’s usability my need for them. True enough, I was able to find items like a net for barbecue which we have been trying hard to find in other stores. The other items were ones that we could use at home and in our ministry in Makati. Thanks to Saizen, I was able to find some additions to my collection of magic tricks at 85 pesos (PHP) each.